He shows how nationalist, anti-American, often racist and anti-Semitic forces evoke Europe’s foulest traditions. The book contains: 1 Russia: On Europe’s Edge, 2 Hungary: Democracy without Democrats, 3. Germany: The Return of Rapallo?, 4 The European Union: Trouble in Paradise, 5 France without Jews, 6 Brexit: From Great Britain to Little England, 7 Greece. From Polis to Populists, 8 Ukraine: The New West Berlin and the “Conclusion: The European Dream. James Kirchick presented the result of seven years travelling Europe in a finely written, fascinating account of current affairs in Europe. 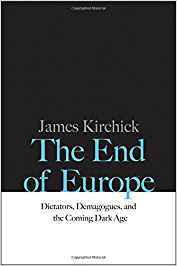 James Kirchick: The End of Europe, Dictators, Demagogues, and the Coming Dark Age, Yale University Press, 2017.